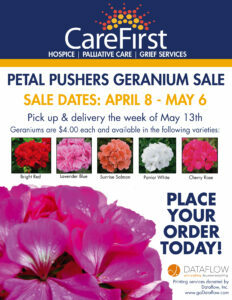 Spring has sprung, which means it is time for our annual Petal Pushers Geranium Sale! 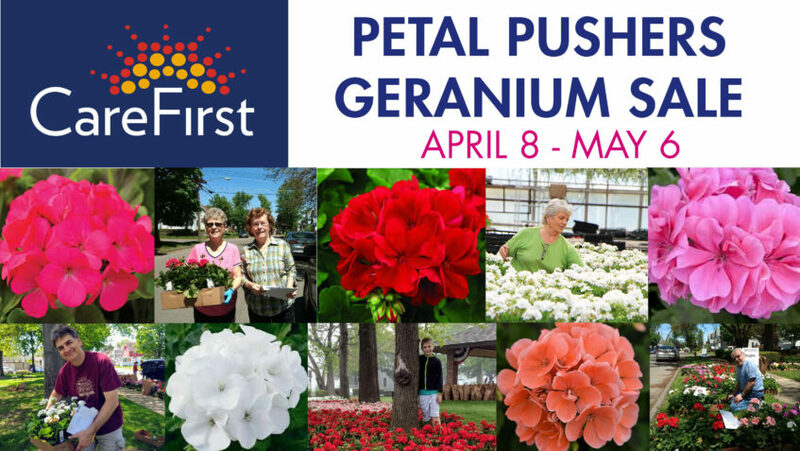 Each year, members like you in the community help us raise nearly $30,000 for local hospice and grief programs, thanks to your support of Petal Pushers. Featuring 5 vibrant color choices at one low price, CareFirst geraniums are some of the most beautiful, hardy plants around, and are provided by http://schaefersgardens.com/. 2019 Geranium color choices- Bright Red, Patriot White, Lavender Blue, Sunrise Salmon, Cherry Rose – each 4 1/2″ pot costs $4. Affirming life through extraordinary, compassionate support and care for the seriously ill and grieving. © 2018 CareFirst. Website by Creagent Marketing. All Rights Reserved.